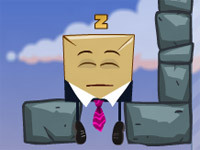 The Wake Up the Box game series are fun and addicting Flash games that are designed to get your thinking up strategic ways to use the forces of gravity to work in your favor in order to wake up the sleepy Mr. Box. 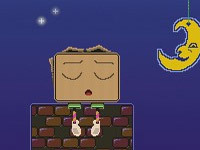 Wake Up the Box 1 is a Flash game with 20 levels. In each level, you must use the shapes provided to force Mr. Box to wake up. Mr. Box is a very sleepy box, and he tends to fall asleep in the most unusual locations. To play the game, you only need your mouse. However, you can use your space bar on your keyboard to restart a level. Keep an eye on the sleep meter located at the top of your screen. That will indicate well you have awaked Mr. Box. 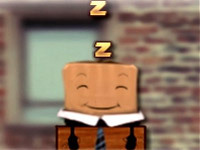 Wake Up the Box 2 – sometimes called the “Office Version” by the games’ fans – is similar to the previous version in that your goal is to wake up Mr. Box from his sleepy state. As usual, Mr. Box falls asleep in unusual locations. 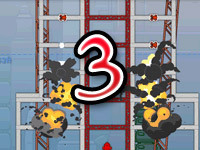 This version of the game features 30 levels, good graphics, and the ability to mute the music and sound effects. Our sleepy little friend – Mr. 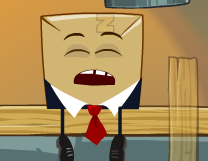 Box – is back again, and as usual, he is fast asleep. You are the only one with the knowledge and understanding of how to awaken him. Place the pre-selected objects on the game board to push, pull, and drag him back to the land of the living. Wake Up the Box 3 has a lot fewer levels to complete than the previous version (16);however, they are all quite challenging. The graphics in this version are much better, though! In addition, you can now clear your game progress to be able to restart the game from the very beginning and unlock each level as many times as you’d like! Mr. Box is asleep again. Can you help wake him up? 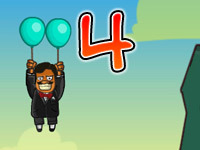 In Wake Up the Box 4, you must use your mouse to draw various shapes in order to wake up Mr. Box. Shapes you might consider drawing could include squares, circles, and wedges. To beat the game, you must wake up Mr. Box in 30 different levels. Once again, our cute, sleepy friend, Mr. Box, is back. As usual, he is sleeping in the most bizarre locations. He needs your help to wake him up! Similarly, to the previous version, in Wake Up the Box 5 you must draw various shapes and designs to wake him up. This version, however, makes that task a little easier by providing easy short cuts to use when making your shapes. 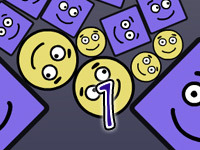 To free-hand draw the shapes, click the “1” button at the top of the screen. In order to draw straight lines, which are useful for making boxes and wedges, click the “2” button. For circles, simply click the “3” button then use your mouse and drag to make the circle larger. Alternatively, you can also click the 1, 2, or 3 buttons on your keyboard. In addition to these new functions, you can also press your “R” key to restart the level, and press the Cnrl + left click (for PC’s) or Cmd + left click (for Mac’s) to remove objects off the playing field. How is it possible for our friend Mr. Box to fall asleep in the middle of an Amusement Park? We don’t know, but he somehow managed to do just that! Now, you must wake him up. To do that, you will need to create a variety of shapes and objects to assist you. Unlike in the previous versions, you are not making wooden objects. This time, you get to play with metal – but remember, metal only attaches to other metal objects! This version features 35 new levels, the ability to link the game to your Facebook account to challenge your friends and show off your scores, as well as a mini-game and Coin Shop.